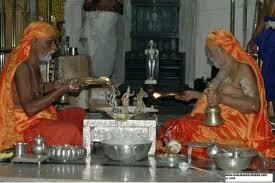 In the ritualistic Hindu Vedic Poojas the deity is worshiped by offering 16 services known as the Shodasa Upacharaas. The pictures and idols of the deities whom we worship in this ritualistic way neither wear the flowers we offer nor eat the fruits.. We do get some satisfaction of having offered something to the deity. But apart from that there is a deeper and greater spiritual significance behind the rituals and that is why they were prescribed and practiced by millions of our ancient seers. Understanding this is known as Antah-Pooja. 1. Aavahanam – Welcoming the deity. 2. Aasanam – Offering seat.Sutra 29. 3. Paadyam – Washing the feet.Sutra 30. 4. Arghyam – Washing the hands.Sutra 31. 5. Aachamanam – Offering water to drink (to wash mouth). 7. Vastram – Offering clothes. 8. Yajnopaveetam – Offering sacred thread. “Yajnopaveetam paramam pavitram prajaapater yat sahajam purastaat aayushyam agriyam pratimuncha shubhram yajnopaveetam bhalam astu tejah”. 12.. Dhoopam – Offering perfumed Incense. 14. Naivedyam – Offering food. Taamboolam consits of beetle leaves, beetle nut and caustic represent the three avasthas or states of the human being – jagrad, swapna and shushupti or waking, dreaming and sleeping states. Offering Tamboolam is the effort to go beyond these states – i.e. to the nirvikalpa state. 16. Pradakshina Namaskaaram – Circumambulation and salutation of the deity. Aavahanam, Aasanam, paadyam, Arghyam, Aachamanam, Madhuparkam, Snaanam, Vastam, Upaveetam, Aabharanam, Gandham, Akshatam, Pushpam, Dhoopam, Deepam, Naivedyam, Taamboolam, Daxinaa, Phalam, Neeraajanam, Pushpaanjalim, Pradaxinam, Namaskaaram, Stotram, Chchatram, Chaamara, Vaahanam, Nrityam, Geetam, Vaadyam, Praarthanam, Visarjanam with mantra pushpam and shaanti paatham.